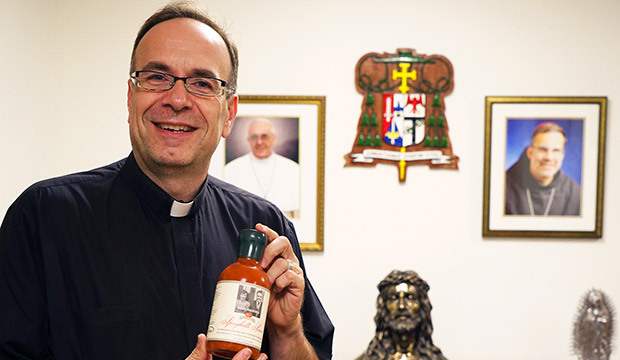 LEXINGTON, Ky. (CNS) — When Father Jim Sichko recalls Tuesdays during his childhood in Orange, Texas, he can almost smell the aroma of his mother's homemade tomato sauce wafting through their home. Marie Ceraso Sichko was a native of Italy who would make fresh sauce, bake delicious dishes, and lay out her finest china for her weekly lunch guests each Tuesday. "Through the front door would come stinky, smelly, garbage sanitation workers," said Father Sichko, who currently serves in the Diocese of Lexington. "They would come in and they would dine," he told Catholic News Service in an interview. "She would serve them." Marie Sichko's simple act of charity for the local sanitation workers has rippled out to touch thousands. Father Sichko decided to bottle her secret sauce recipe and, after his mother died unexpectedly last year, chose to donate the proceeds from sauce sales as a tribute to her memory. Now, just two months after Father Sichko unveiled "Miss Marie's Spaghetti Sauce," the bottles can be found on the shelves of more than a dozen Kentucky retailers, are used at high-end Lexington restaurants, and have been shipped across the country through Father Sichko's website, www.frjims.com. "All of our gifts can be used for the greater glory of God and just as my mother fed others, even in her death and rising to new life, she continues to feed people that don't even know her," Father Sichko said. "To think that he would take part of those proceeds and bless the diocese," said Debbie Swisher, the finance officer for the Lexington Diocese, "it's just tremendous." Lexington is designated a "mission diocese" because many of its parishes cannot support themselves. Only about 3 percent of the population is Catholic; most of the diocese's territory is comprised of the Appalachian area, known to be one of the poorest parts of the country. "People come to our doors all the time needing assistance with pharmacy, needing food, needing basic needs for themselves and for their families," Swisher told CNS. Proceeds from sauce sales will bolster the diocese's annual appeal, which helps to fund Catholic Charities' outreaches as well as other ministries such as Catholic schools, young adult ministry, seminarian education, and sustaining retired priests. 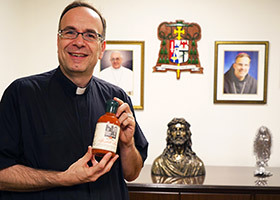 Father Sichko calls his sauce shipments a unique method of evangelization. He himself is a full-time evangelist, appointed by Pope Francis in 2016 as a "missionary of mercy." He still travels the United States for speaking engagements and regularly makes headlines for performing random acts of kindness, such as giving $6,000 to the employees of a coffee shop. "Sadly, we live in a very angry, a very negative society right now," explained Father Sichko, "and I believe that people are looking for ways of kindness and goodness and a sense of returning to basic principles and values of giving, of being kind, of loving our neighbor." The story of the sauce has inspired at least one local chef to pay it forward. Jeremy Ashby decided to incorporate Miss Marie's into the menu of his two Lexington restaurants, Brasabana and AZUR Restaurant and Patio. For each children's spaghetti dish sold at either restaurant, Ashby gives most of the proceeds to a local organization called Fayette Eating Education & Delivery, or FEED, which provides weekend meals to youngsters in need. "Some kids are afraid to go home for the weekend because they're gonna be hungry until Monday," Ashby explained of FEED, "so they pack backpacks and give them to the kids, so they have something to eat for the weekend." For adults, Ashby uses Miss Marie's in a dish with spaghetti, bacon and caramelized onions. "(The sauce) just kind of exudes that home-cooked, simple feeling that brings you back to grandma's table," he said. Father Sichko's supplier just bottled 4,200 more jars of Miss Marie's Spaghetti Sauce. The priest envisions that, through her recipe, his mother's generosity will continue to spread far into the future. "I think her legacy of prayer, her legacy of feeding, her legacy of love, and embracing all is what continues," Father Sichko said.